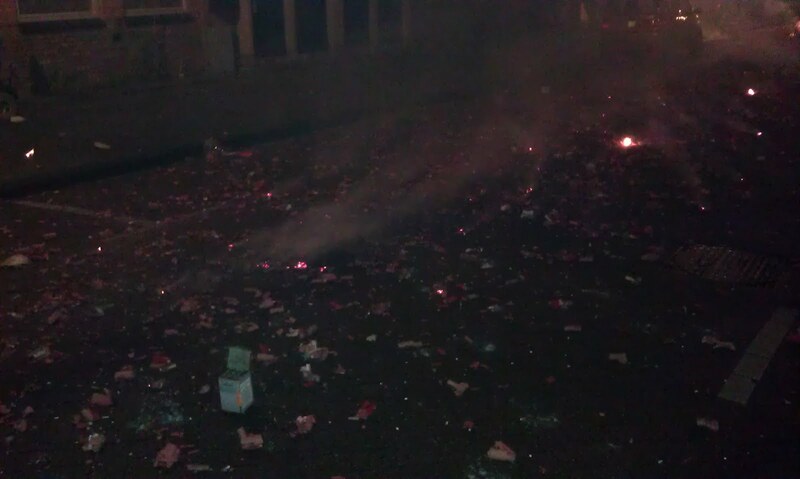 Overseas Exile: Happy New Year from Amsterdam! If you're the sort to make New Year's resolutions, resolve to follow your dreams and move to another country. You have one year. Go! This will be my last New Year's celebration while living in Amsterdam. I feel a bit melancholic about that, but there you go. My life is changing (again!) and we're moving to Paris in couple of weeks. New Year's Eve was spent having a wonderful dinner with our friends Jurian and Madelijn. We enjoyed escargot, lobster, champagne and vanilla ice cream. Philistine that I am, I still preferred the beer to the champagne. Don't tell anyone! When midnight struck, Amsterdam detonated. Honestly, I can't think of any other way of describing it. 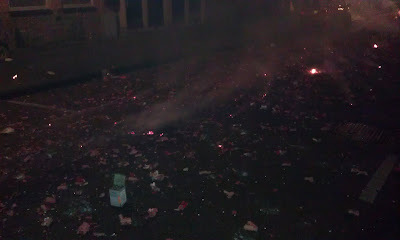 Amsterdam celebrates the New Year the way the US celebrates the 4th of July: with lots of fireworks. Except that, unlike much of the US, very, very powerful fireworks can be bought by just about anyone. You travel to Belgium, lay down a few hundred Euro and help turn Amsterdam into a war zone. Of course, this is not without its drawbacks, but it was a fun evening nonetheless. One thing which astonished me was our daughter. With all of the bright lights and loud explosions, I expected her to burst into tears. Nope. She was delighted (and tired) and was content to just watch everything. Meanwhile, there's a little cleaning up left to do. Sadly, these sorts of fireworks are illegal in France, so it may be the last time I see anything like this again. We'll have to bring our daughter back when she's old enough to understand this. Or maybe we'll just come back to see our friends. I'll miss this city. "Sadly, these sorts of fireworks are illegal in France"
Oh yes, they are illegal all right. Prepare to get bored and cold on the Champs Elysées, waiting for the non-firework for the new year!